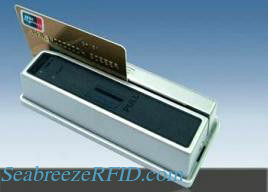 Apply to banks, office buildings and other auto-door access control. Using aluminum alloy shell, firm structure, beautiful appearance. 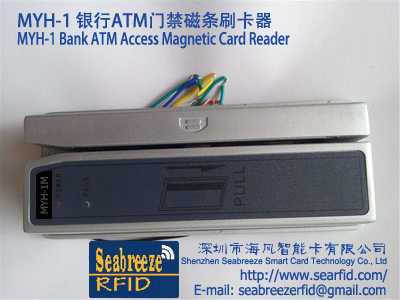 ①any bank ATM card can be used, no capacity constraints. ②aluminum alloy shell firm durable, anti-disassembly screw design, anti-theft anti-pry. ③Magnetic head reading conforms to the ANSI/ISO standard.imported alloy magnetic head high sensitivity, super wear-resistant, HICO (4000Oe) or LOCO (300Oe) card can be used. ④embedded optical coupling open delay input button contact, convenient installation out button switch. ⑤sound and light dual status indicator for read card; and has the anti-pry alarm remote output interface. ⑥Wiegand card number output, online server, faithfully recording staff into and out of time. ⑦adopt the unique anti-jamming method, easy to install and use a variety of environment.